It’s never easy being a teacher. Sometimes, you might find your school is underfunded and you need to buy supplies for your classroom. 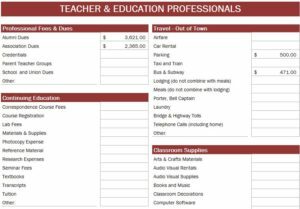 The free Teachers & Education Expense Sheet can help you figure out the cost of anything you may need and plan an appropriate budget to ensure your kids get exactly what they need. It doesn’t matter whether you need new computers or textbooks for your class, this template can help you plan for the future. Using this free tool, you can find ways to afford the items your students need to succeed in the classroom. You can think of the Teachers & Education Expense Sheet as you a new way to start budgeting for the future of your classroom. To get started, you can download the free template by following the given list of instructions below. To download the free template document, you can follow the link at the bottom of this page. You will begin in the section marked “Professional Fees & Dues” You will enter the dollar amount for all the subcategories that apply to your teaching expenses. You can also choose to change the categories and subcategories to items that fit your needs. For example, you might want to list afterschool programs that you fund instead of “other” in this category. In the same manner, you will go through each category table and add or delete items that make sense for you. When you complete the document, you can find a grand total at the very bottom of this sheet. This free template sheet gives you exactly what you need to create a budget for your classroom and show you what you might need to make your student’s experience a great one.